Photo: The Montgomery-Janes-Whittaker House, ca. 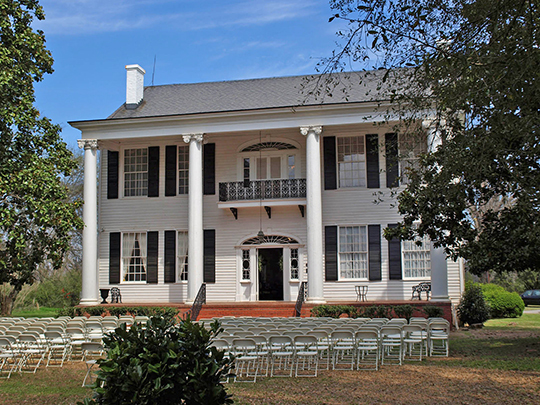 1822-1844, Prattville, AL. Listed on the National Register of Historic Places in 1974. Photograph by User:Spyder_Monkey (own work), 2010, [cc-by-3.0 (creativecommons.org/licenses/by/3.0)], via Wikimedia Commons, accessed March, 2014. The Autauga County Courthouse is located at 134 North Court Street, Prattville, AL 36067; phone: 334-361-3701. The county was established in November, 1818. Permanent settlers began to arrive ca. 1816. Among the early settlers were William W. Bibb, the first Governor of Alabama.